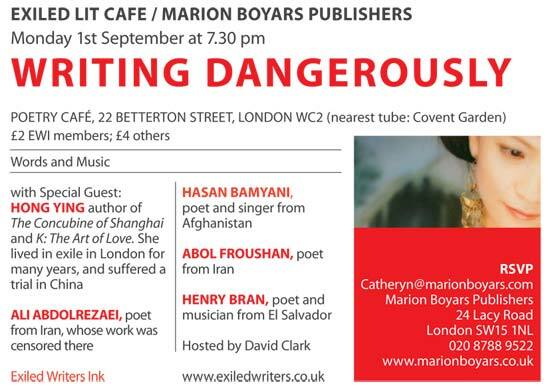 No Exiled Lit Cafe event as we have a high profile event at The Gallery, Foyles Bookshop. See Activities page. Gregorio Kohon, poet and novelist from Argentina, author of Red Parrot, Wooden Leg and a new collection of poetry. Moris Farhi, award-winning poet and novelist born in Turkey, author of Young Turk translated into many languages, and other works. Bart Wolffe, eminent Zimbabwean playwright, poet and writer, author of Persona Non Grata and many other works. Ghazi Rabihavi, playwright – from Iran. Mara Lockowandt is the director of Ghazi’s playlet about the issue of women in Iran. Albert Pellicer, poet – from Spain,accompanied by Mark Matsena – saxophonist. EXILED WRITERS INK! presents an evening of poetry and readings with award winning writers – Cypriotturkish Aydin Mehmet Ali and Valdemar Kalinin from Belorussia. Both speakers have written academic books, poems and stories, and are internationally famous. Aydin is a well known member of Britain’s Cypriot community, while Valdemar plays an active role in the Roma community in Britain. Mir Mahfuz Ali was born in Dhaka, Bangladesh and studied at Essex university. He dances, acts, has worked as a male model and a tandoori chef. He has given readings and performances at the Royal Opera House and other theatres in Britain and beyond. His poems have appeared in London Magazine, Poetry London, Ambit and Exiled Ink. He is currently preparing his first collection for publication. He has been working closely with his mentor, Moniza Alvi and was short-listed for the New Writing Ventures Awards 2007. Shereen Pandit was a South African lawyer and political activist before coming into exile in the UK in 1987 where she completed a PhD in Law. Her short stories have appeared in many anthologies and magazines and have won several prizes including the Booktrust London Award. Her articles and reviews have appeared in several magazines. 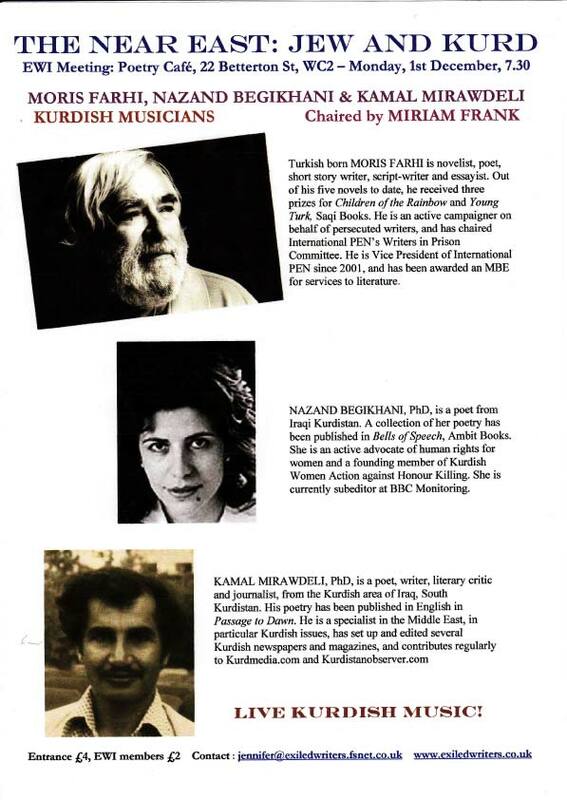 Shirin Razavian was born in Tehran where she studied Persian and English Literature. Because of the censorship and lack of freedom of expression, she fled her country and started building a new life in London. She has published three Persian poetry books in London in 1995, 1999 and 2001. Her Farsi-English book Which Shade of Blue? is being published in the USA shortly. Shirin has had several radio and TV interviews with the BBC, Voice of America, Radio Azadi, Radio Israel and other Persian exiled media. A Golden Bowl by Mir Mahfuz Ali, Flamingoes at Sunset by Shereen Pandit and Free Fall by Shirin Razavian. Vahni Capildeo born in Trinidad, 1973 came to England in 1991 to study English and then Old Norse. She has worked at Girton College, Cambridge and at the Oxford English Dictionary, and currently is a contributing editor at the Caribbean Review of Books. She has returned often to Trinidad and spent time in Iceland. Books: No Traveller Returns (Salt, 2003); Person Animal Figure (Landfill, 2005); The Undraining Sea (looking for a home). Her poems and prose have appeared in various magazines and anthologies, including Agenda, Oxford Magazine, Poetry Salzburg, Poetry Wales, Sentence, Stand, Tears in the Fence, The Oxford Book of Caribbean Verse, London: City of Disappearances (ed. Iain Sinclair) and Trinidad Noir (Akashic, forthcoming 2008). Pascale Petit, a renowned poet, she has published four prize-winning poetry collections and was twice shortlisted for TS Eliot Prize. Pascale Petit’s last two collections, The Zoo Father and The Huntress, were both shortlisted for the TS Eliot prize. A poem from The Zoo Father was also shortlisted for the Forward prize for best individual poem. A Next Generation Poet, she has been Poetry Editor of Poetry London and tutors at Oxford University and Middlesex University where she is the Royal Literary Fund Fellow. Saradha Soobrayen received an Eric Gregory Award in 2004. Her poems are published in Wasafiri, Poetry Review, and in the anthologies This Little Stretch of Life (HearingEye), I am twenty people! (Enitharmon), New Writing 15 (Granta/The British Council 2007), New Poetries IV, (Carcanet) and the 2007 Oxford Poets Anthology (Carcanet). Her short fiction appears in Kin: New Fiction by Black and Asian Women. (Serpents’ Tail, 2003) Saradha facilitates poetry workshops, mentoring and professional development for writers. Hosted by Mir Mahfuz Ali. Ghias Al Jundi Poet, writer and human rights activist will read his work. Originally from Syria he lives in exile in London after being persecuted for writing in a human rights magazine in his home country. He wrote for student newspapers in Syria and has freelanced for al-Safir in Beirut and al-Quds al-Arabi in London. He has been living in London for 8 years, writes poetry and short stories and has had one play performed in London. He is a committee member of Exiled Writers Ink and a volunteer for Amnesty International, and is involved in the Write to Life project – a creative writing programme for torture survivors coordinated by the Medical Foundation for the Care of Victims of Torture. First performance of ‘Lili’s Story’ by Parvin Soltani and performance of Ghazi Rabihavi’s play ‘The Hat’. Haike Beruriah and Stephen Watts reading the work of the poet, Stencl, in Yiddish and English. (Published 2007, Five Leaves). Haike Beruriah reading her own poetry. Renee Martin reading Ladino poetry and her own short stories.